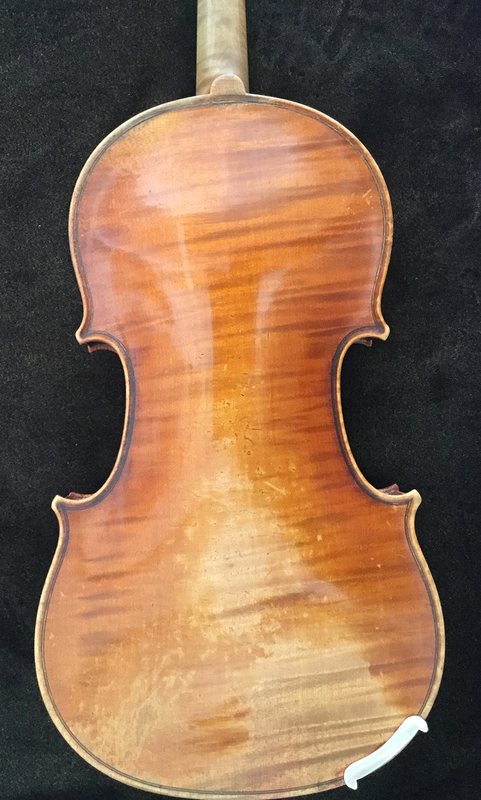 This violin was made in 1856 by August Sebastien Phillipe Bernadel (otherwise known as “Bernadek pere”). Born in 1798, Bernadel pere was a contemporary of J.B. Vuillaume, and worked for Nicolas Lupot and Gand. He was the grandfather of Leon Bernadel. In the entry in the “Universal Dictionary of Violin and Bow Makers,” Henley describes his violins as having “a remarkably full resonance and a quick mellowing refinement.” He also considers his violins superior to Italian instruments of the same price and period. The violinis a first class instrument with a warm, strong tone and great ease of playing. The top has repairswith cracks properly cleated on the inside. The price reflects this condition which is nonetheless structurally strong. For further information, please call or email us.